For more information about this event, please contact The Underground Ltd. at contact@undergroundhk.com. It’s The Underground’s 15th birthday! And like all unruly teenagers, we’re going to be making some noise! 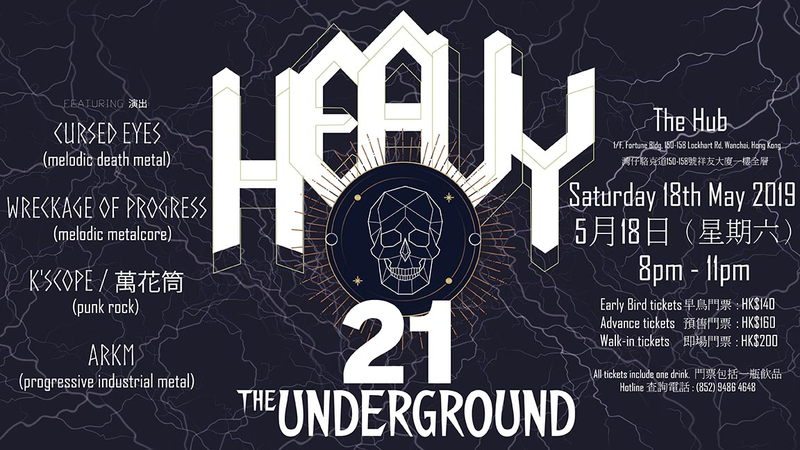 In true Underground tradition, it will be a night to showcase some of Hong Kong's most entertaining live acts. Over the years we’ve brought you more than 600 bands (many of them now regular faces at The Underground) and we’ve watched countless newcomer acts blossom into local live favourites. This special party will open with singer-songwriter Jules O'Brien's new band "Sunset Moth", known for her stunning voice and bittersweet songs, catch her band's enthralling live set for a very special way to start the evening. Next, up and coming favourites Cracklebox take over the stage as they crank up the energy with their unique brand of alternative indie pop, guaranteed to get your head nodding. Then fresh from their Taiwan Golden Indie Music Awards nomination for Best Overseas Album are shapeshifters Per se. Bringing us the kind of uplifting, poetic pop a birthday party needs. Mischievous quintet Bliss then join us as they continue with the claim they have been awarded "Hong Kong's Sexiest Rock Band 2016/17". Come and decide for yourself! They’ll share their unique blend of riffs and humour that combine for an unmissable set. We then welcome back Senseless, returning to both The Underground & Grappa's stage for a set of pop-punk rhythms and stage theatrics guaranteed to bring the party home. And if you weren’t dancing before, you will be when headline act and Hong Kong royalty SHUMKING MANSION take to the stage to deliver the usual psychedelic dance rock that will take your mind to another dimension. 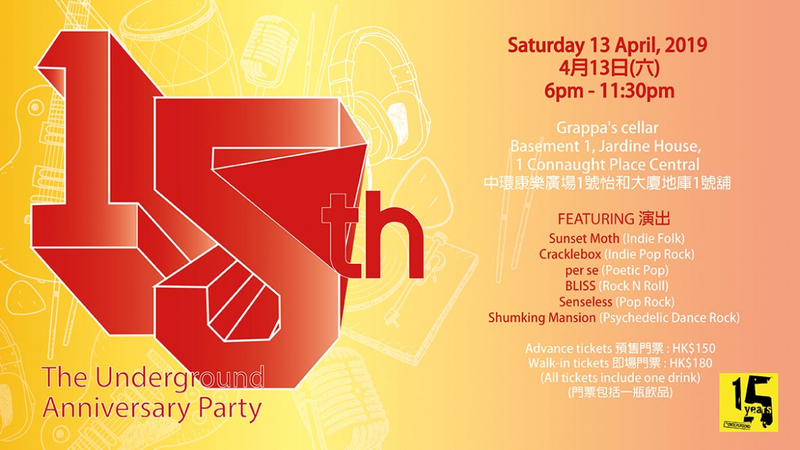 Come check out all these great acts, dance, eat pizza, maybe even win a prize at the lucky draw, all to celebrate 15 years of The Underground showcasing original music in Hong Kong. Tickets are going to go fast so get your Early Bird tickets for only $120 (until 15 March). Advance tickets are $150 and on the door it’s $180. All tickets include a drink and a lucky draw coupon. Jules, Noah, Godfrey, Joseph and Alex are Sunset Moth, an indie outfit with a story to tell. Fronted by singer-songwriter Jules O’Brien, Sunset Moth's explosive love songs, relatable tantrums, and splashes of summery folk-pop have graced multiple great stages (previously as Jules and the Lazy Noahs) in Hong Kong since their inception in late 2018 - including the Central Harbourfront for HKTB's Dragon Boat Festival, the main stage at Lamma Fun Day, The Aftermath, and more. Jules O'Brien has been writing music and performing as a soloist since her childhood in London. In Hong Kong, she has featured three times at Sofar Sounds, and multiple times at Underground HK events. She has been featured in the SCMP’s Sunday Post; played at Time Out’s Moonrise Picnic in October, and has featured in multiple showcases across the city. From her time in the UK, Jules has a long history of live shows — including sharing stages with the likes of Ed Sheeran, Noisettes and Benjamin Francis Leftwich, and taking the stage at London's infamous jazz bar Ronnie Scott's. Shumking Mansion is an Indie band that plays an intense blend of upbeat Dance Rock and Synth Pop with a Psychedelic energy. per se is a music duo composed of music talents: Stephen Mok and Sandy Ip. The name meansintrinsic or in itself, which reflects their music being just music without the limitations andburdens of genre or style.They started by releasing their debut EP in 2013 and have since released 2 concept albums(《Conundrum》in 2016 &《ends》in 2018) revolving around the puzzles of life and differentends.This year, per se has started on a new music project《Ripples, reflections and everything inbetween》to discuss the differences of how each person views and values time using historicalevents as song inspirations. To compliment that, the project was launched as a Calendar andnew songs will be released on the same day as when these historical events occurred. Formed between 2001-02, followed by subsequent reforms and reorganisations, Senseless finally found the most senseless line-up in 2006 and kept it until now. While influenced by many artists including The Killers, Tokyo Incidents, Beyond, The Cribs, Metallica, Beethoven and even songs for children, they focus on Rock music. Their songs mostly express their dissatisfaction to The Society, also shout their own views toward The World. From Street Fighter to barbecue wings, from argues to break up, from homework to parent’s pressure, Senseless’s songs try to mock and scream about all the unhappiness in life. Life is Senseless. Let’s scream and shout!